One of BIOplastics innovations is in product coding and labeling with BIOplastics BPLPM, which incorporates mico particles into a selected range of products. The BPLPM technology (BIOplastics particle mix) products are offered in addition to the regular range of products. The inert particles, by nature, increase signal to noise ratios in Real-Time PCR applications. BPLPM provides indelible IN PRODUCT labeling and identification. While others use ink, stamps, or dyes containing organic solutions or stickers, BIOplastics’ BPLPM technology results in a non-removable, unique marking and coding of the product. No writing with markers, no mistakes, no removal of marks, no double identification numbers; just use the unique ID# at the beginning of your process. 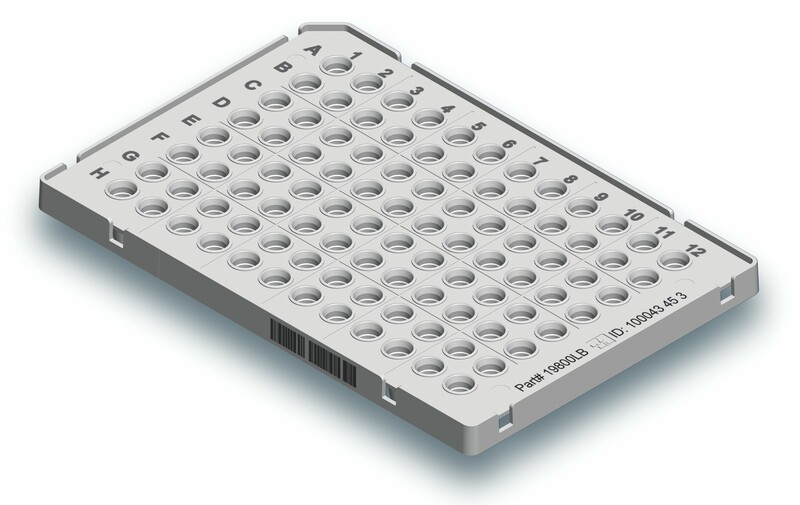 Link the unique ID# to your Lab LIMS system and samples. Bar coded” products are bar coded by means of in product laser marking. In opposite of the use of a “sticker” the laser mark bar code can not be removed at all not can it be destroyed. It is therefore the ultimate tool for traceability which is particularly useful for accredited labs in pre-diagnostic and diagnostic settings. This type of laser-coding improves procedures and reduces the risk of label failures. Depending on volumes, custom layouts and customized codes including 2D coding are available. Forensic labs, kit manufacturers and others can benefit this superior technology which enables to effectively trace products and applications. Laser mark coded products are already unique and irreversible ID-ed. For those customers who would like to go beyond these already unique ID markings BIOplastics enables the possibility for incorporating an RFID chip in its products. By doing so the products are programmable, scan and readable. This might be particularly interesting in combination with unique ID’s for diagnostic kits, diagnostic testing combining instruments, applications and other parameters as well as for e.g. storage purposes. Contact BIOplastics for demands, information and possibilities.